Hermes Trismegistus depicted in a medieval rendering. 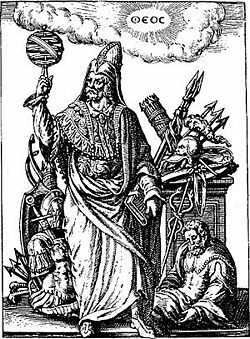 Hermeticism is a set of philosophical and religious beliefs based primarily upon the writings attributed to Hermes Trismegistus, a syncretic amalgamation of Hermes and Thoth. The movement is generally traced to Alexandria in the first centuries of the Common Era, where it unified elements of Jewish and Christian mysticism with Hellenistic philosophy and Egyptian occultic beliefs. The resulting composite tradition proved to be both persuasive and perdurable, as it proved compelling to both Muslim scholars in the early Middle Ages and European intellectuals at the dawn of the Renaissance. In particular, the notion that the universe operated based on orderly principles — in this case, represented as cosmic vibrations in the substance of the All — was instrumental not only to western occultism, but also to the development of the modern scientific method. This connection can be seen most clearly in the hermetical and alchemical treatises written by some of the most influential thinkers of their respective eras, including Giordano Bruno, John Dee, Francis Bacon, and Isaac Newton. 2.3.3 "As above, so below"
Sometime in the first centuries of the Common Era, a new trend in pagan religio-philosophical thought emerged, challenging the then-dominant Platonic paradigm with a more concrete form of spiritual expression. Hermeticism, as the tradition came to be known, was largely a product of Alexandrian syncretism, drawing together themes from Judaism, Hellenistic philosophy and mythology, and classical Egyptian religion. In the last case, this literature combined philosophical and religious theory with various schools of practical magic popular at the time, including the stereotypical Egyptian concerns with conjuring spirits and animating statues, the Hellenistic writings of Greco-Babylonian astrology, and the newly developed practice of alchemy. In a parallel tradition, Hermetic philosophy rationalized and systematized cultic practices and offered the adept a method of personal ascension from the constraints of physical being, which has led to confusion of Hermeticism with Gnosticism, which was developing contemporaneously. Quispel provides an eloquent summary of this period of religio-philosophical development: The Definitions of Hermes Trismegistus to Asclepius in Armenian and Greek definitively prove that Gnosticism-pagan, Jewish and Christian-originated in Alexandria about the beginning of the Christian Era. Philo sometimes argues that there are three classes of men, but seems to polemicise against an invisible opposition when he opines that man at his creation received God's pnok only, but not God's pneuma. His opponents may have been the circle of esoteric Jews mentioned by the philosopher Numenius, who indeed distinguished the higher Spirit from life, psyché, but also stressed that this divine element in man was a gift of God. From them even the Hermeticists learned that not all men have the Spirit as opposed to the soul. The traditional Greek Hermes, clad in chalmys and winged hat and sandals, is not unknown to the magical papyri, but the autochthonous Thoth is commoner; and if Hermes succeeded in becoming a dynamic element in Graeco-Egyptian popular religion, it was largely thanks to his alliance with his native counterpart, which allowed him to be thought of as more Egyptian than Greek. At first Hermes Egyptianized by translating, either literally or metaphorically, the attributes of Thoth. One can see this clearly in his titulature. From the third century B.C.E. onwards we find attached to the name of Hermes formulae … which clearly originated in Egyptian designations of Thoth, while the familiar title 'Trismegistus' acquired canonicity only in the Roman period. Similarly, the Greeks fell into the habit of celebrating their god Hermes in a festival, the Hermaea, which coincided exactly - in fact was identical - with one of the major festivals of Thoth. With time, naturally enough, this carefulness bred of unfamiliarity came to seem less necessary. As far as Hermes was concerned, the popularity of his cult at Hermoupolis must have contributed a great deal to the dissolving of cultural barriers and the evolution of the composite Hermes Trismegistus of late antiquity. As a divine fountain of writing, Hermes Trismegistus was credited with tens of thousands of writings of high standing, reputed to be of extreme antiquity. This perceived connection between Egypt and archaic mystical revelation can be traced back to Plato's Timaeus, which describes the temple of Neith at Sais (on the Nile delta) as the site of secret halls containing historical records that had been kept for 9,000 years. In the early centuries of the Common Era, Clement of Alexandria promulgated this impression with his suggestion that the Egyptians had forty-two sacred writings by Hermes, encapsulating all the training of Egyptian priests. Siegfried Morenz has suggested that "the reference to Thoth's authorship...is based on ancient tradition; the figure forty-two probably stems from the number of Egyptian nomes, and thus conveys the notion of completeness." The Neo-Platonic writers took up Clement's "forty-two essential texts." The so-called "Hermetic literature" itself, the Hermetica, is a category of papyri containing spells, mystical discourses, and theological discussion. For instance, the dialogue called the Asclepius (after the Greek god of healing) described the art of imprisoning the souls of demons or of angels in statues with the help of herbs, gems and odors, such that the statue could speak and prophesy (§26, 27). In other papyri, there are other recipes for constructing such images and animating them, as well as performing many other magical operations. After centuries of falling out of favor, Hermeticism was reintroduced to the West when a monk named Leonardo di Pistoia brought an edition of the Corpus Hermeticum to his hometown in 1460 C.E. He was one of many agents sent out by Pistoia's ruler, Cosimo de' Medici, to scour European monasteries for lost ancient writings, which would allow him to actualize his dream of constructing an Academy of philosophical thought. These newfound texts "aroused great interest, since Hermes Trismegistus at the time was perceived to be a pagan contemporary of the law-giver Moses. Consequently, the wisdom and revelations Hermes Trismegistus transmitted were pre-Christian, and yet seemed to announce Christianity: as a result, Hermes was celebrated as a pagan prophesying the coming of Christ." Amongst other things, in his [Lazzarelli's] main work Crater Hermetis, he describes the creation/transformation of 'new men' in a context that stresses the convergence, if not equivalence, of Hermeticism and the Christian religion. The close connection that Bonus had established between alchemical and Christian truths and his interpretation that concrete alchemical changes embodied religious truths certainly appeared to him of great interest within the framework of his syncretistic approach. On the scientific side, the Emerald Tablet [a prominent Hermetic text] appears to have had significance for Newton primarily in the area of matter theory. This discover is not surprising, of course, since alchemy concerned itself with the various manifestations and transformations of matter, and the Emerald Tablet was no exception to that rule despite its obscurity. One will not find in it the particles associated with modern matter theory, but even a casual reading … will reveal several pair of related material opposites: sun/moon, father/mother, earth/fire, subtle/gross, things superior/things inferior. To Newton, pairs of that sort, and their unions, represented the most fundamental, the most basic, relationships of matter as it arose in organized forms from a primitive chaos. The theological significance of Newton's commentary on the Emerald Tablet lies with his speculations about the activating spirit. For Newton, … it was theologically unacceptable for the forces that generated activity in nature to be designated as intrinsic components of matter. Activity - the generation of activity - had to reside in the realm of the spirit. The generation of activity was the province of divinity. To attribute to "brute matter" the capacity for initiating motion would give it an independence of the divine that could lead to atheism. Newton was always aware of the dangerous potentiality of attributing activity to matter, and always insisted that his forces acted only between particles. They were not really a part of matter itself, but were manifestations of God's activity in nature. In 1614 C.E., Isaac Casaubon, a Swiss philologist, analyzed the Hermetic texts for linguistic style and claimed that rather than being the output of an ancient Egyptian priest, they could be dated to the Christian Era — conclusions that remain persuasive almost four centuries later. After Casaubon's dramatic revelation, the texts lost considerable prestige and retreated into relative obscurity for several centuries. In fact, save the role of Hermetic thought in various occultic orders (such as the Rosicrucians and the Hermetic Order of the Golden Dawn), the movement was practically absent from intellectual discourse until 1945 C.E., when versions of various Hermetic writings were found at Nag Hammadi. This discovery, which included both mystical dialogues and a Coptic account of Hermetic mystery schools, prompted a renewed scholarly interest in this esoteric school of thought. Antoine Faivre, in The Eternal Hermes (1995) has pointed out that Hermes Trismegistus also had a place in the Islamic tradition, though the name Hermes does not itself appear in the Qur'an. Hagiographers and chroniclers of the first centuries of the Islamic Hegira quickly identified Hermes Trismegistus with |Idris, the nabi of surahs 19.57; 21.85, whom the Arabs also identify with Enoch (cf. Genesis 5.18-24). "A faceless prophet," writes the Islamicist Pierre Lory, "Hermes possesses no concrete or salient characteristics, differing in this regard from most of the major figures of the Bible and the Quran." Though the Islamic incarnation of the Hermetic tradition has received comparatively less scholarly attention than its European counterpart, some suggestive studies have demonstrated the role of Hermeticism (and its associated disciplines of astrology and alchemy) on the development of Islamic science and mysticism. In Hermetic religion, the supreme Deity, or Principle, is referred to variously as 'God', 'The All', or 'The One'. Many Hermeticists also align their beliefs and mystical ideas with other religions, including Christianity, Buddhism, Judaism, mainstream Paganism, or Islam. This pluralism is related to a form of doctrinal essentialism, which holds that all great religions have equivalent mystical truths at their core, and that all religions are, in some way, compatible with the esoteric tenets of Hermeticism. Tobias Churton, scholar of obscure religious movements, states that "the Hermetic tradition was both moderate and flexible, offering a tolerant philosophical religion, a religion of the (omnipresent) mind, a purified perception of God, the cosmos, and the self, and much positive encouragement for the spiritual seeker, all of which the student could take anywhere." This being said, not all Hermeticists take a religious approach, some consider it only to be a system of philosophy or practical magic. Though many texts have been falsely attributed to Hermes Trismegistus, Hermeticists commonly accept forty two books as genuine components of the Hermetic revelation. However, most of these books are reported to have been destroyed when the Great Library of Alexandria was razed. The Corpus Hermeticum - the body of work most widely known and is the aforementioned Greek texts. These sixteen books are set up as dialogues between Hermes and a series of others. The first book involves a discussion between Poimandres (also known as Nous and God) and Hermes, supposedly resulting from a meditative state, and is the first time that Hermes is in contact with God. Poimandres teaches the secrets of the Universe to Hermes, and later books generally consist of Hermes passing these revelations on to others (such as Asclepius and his son Tat). The Emerald Tablet of Hermes Trismegistus - a short work that coins the well-known occult maxim: "As above, so below." The actual text of that aphorism, as translated by Dennis W. Hauck is "That which is Below corresponds to that which is Above, and that which is Above corresponds to that which is Below, to accomplish the miracle of the One Thing." The tablet also references the three parts of the wisdom of the whole universe, to which Hermes claims his knowledge of these three parts is why he received the name Trismegistus ("thrice great"). According to a mythical etiology, this tablet was originally found by Alexander the Great at Hebron, where it was supposedly laid in the tomb of Hermes. The Kybalion: Hermetic Philosophy - a modern text, published in 1912 C.E. by three anonymous authors calling themselves the "Three Initiates." Despite its modern provenance, the text contains lucid expositions of many of Hermetic principles, which earned it a place of prominence among modern Hermetic movements. Thoth, the ibis-headed god of Knowledge, closely related, if not equivalent, to Hermes Trismegistus. Alchemy - The Operation of the Sun. This discipline is not simply the changing of physical lead into physical gold. It is an investigation into the spiritual constitution, or life of matter and material existence through an application of the mysteries of birth, death and resurrection. The various stages of chemical distillation and fermentation, among them, are aspects of these mysteries, that, when applied quicken Nature's processes in order to bring a natural body to perfection. Astrology - The Operation of the Moon. 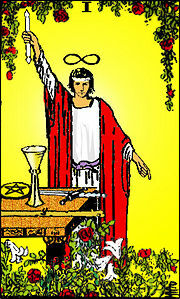 Hermes claims that Zoroaster discovered this part of the wisdom of the whole universe, astrology, and taught it to man. In Hermetic thought, it is likely that the movements of the planets have meaning beyond the laws of physics and actually holding metaphorical value as symbols in the mind of The All, or God. Astrology has influences upon the Earth, but does not dictate our actions, and wisdom is gained when we know what these influences are and how to deal with them. Theurgy - The Operation of the Stars. According to Giovanni Pico della Mirandola's Apology (a famous hermetic text), there are two different types of magic, which are polar opposites of one another. The first is γοητεια (Goëtia), black magic reliant upon alliances with evil spirits (i.e., demons). The second is Theurgy, divine magic reliant upon alliances with divine spirits (i.e., angels, archangels, gods). Theurgy translates to "The Science or art of Divine Works" and is the practical aspect of the Hermetic art of alchemy. Furthermore, alchemy is seen as the "key" to theurgy, the ultimate goal of which is to become united with higher counterparts, leading to the attainment of Divine Consciousness. and hence the marvelous cojunctions of it and admirable effects, since this is the way by which these marvels may be brought about. As "Hermeticism" refers to a disparate, esoteric and often persecuted religio-philosophical system, its specific points of doctrine were not rigidly defined. This being said, certain attitudes and conventions — many of which were derived directly from the Corpus Hermeticum — did become predominant elements of the hermetic cosmology and worldview. In particular, hermetic thought generally tends towards either a monistic or panentheistic understanding of ultimate reality, with all of creation existing as a subset of a cosmic "All" or "Cause." This perspective is echoed in the Kybalion, which states: "We have given you the Hermetic Teaching in regarding the Mental Nature of the Universe - the truth that 'the Universe is Mental - held in the Mind of THE ALL.'" However, such beliefs are held in tandem with a highly realized theology/cosmology, featuring gods and angels, ascended masters and elementals, as well as various varieties of good and evil spirits. All entities are understood to exist as processes or vibrations in Ultimate Reality, such that the only difference between different states of physical matter, mentality, and spirituality is the frequency of their vibration. The higher the vibration, the further it is from base matter. The four classical elements of earth, water, air, and fire are used often in alchemy, and are alluded to several times in the Corpus Hermeticum — in particular, in the creation account described in Book I. The Magician displaying the Hermetic concept of "As Above, So Below." It is thought that the modern Tarot may be based on The Book of Thoth. This cosmic formula, which describes the fundamental relationship between macrocosm and microcosm, is ubiquitous in occult and magical circles, emerging from the Hermetic understanding of the universe. The concept was first elucidated in The Emerald Tablet of Hermes Trismegistus, as follows: "That which is Below corresponds to that which is Above, and that which is Above, corresponds to that which is Below, to accomplish the miracles of the One Thing." In this way, an understanding of the self (the most basic microcosm), one can achieve insight into spiritual or even ultimate reality. "O son, how many bodies we have to pass through, how many bands of demons, through how many series of repetitions and cycles of the stars, before we hasten to the One alone?" Likewise, Manly P. Hall claims that Hermeticists generally accept this concept, thought it is not absolutely vital to their worldview. Hermes explains in Book 9 of the Corpus Hermeticum that the mind brings forth both good and evil, depending on if it receives input from God(s) or from the demons. God brings good, while the demons bring evil. Mind conceives of every mental product: both the good, when the mind receives seed from god, as well as the contrary kind, when the seeds come from some demonic being. Unless it is illuminated by god, no part of the cosmos is without a demon that steals into the mind to sow the seed of its own energy, and what has been been sown the mind conceives. For instance, the malign realities brought about by demonic influence include "adultery, murder, violence to one's father, sacrilege, ungodliness, strangling, suicide from a cliff and all such other demonic actions." This provides a clearcut view that Hermeticism does indeed include a sense of morality. However, the word "good" is used very strictly, to be restricted to use to the Supreme Good, God. It is only God (in the sense of the Supreme Good, not The All) who is completely free of evil to be considered good. Men are exempt of having the chance of being good, for they have a body, consumed in the physical nature, ignorant of the Supreme Good. "As processions passing in the road cannot achieve anything themselves yet still obstruct others, so these men merely process through the universe, led by the pleasures of the body." [The elements of nature arose] from the counsel of god which, having taken in the word and having seen the beautiful cosmos, imitated it, having become a cosmos through its own elements and its progeny of souls. The mind who is god, being androgyne and existing as life and light, by speaking gave birth to a second mind, a craftsman, who, as god of fire and spirit, crafted seven governors; they encompass the sensible world in circles, and their government is called fate. From the elements that weigh downwards, the word of god leapt straight up to the pure craftwork of nature and united with the craftsman-mind (for the word was of the same substance). The weighty elements of nature were left behind, bereft of reason, so as to be mere matter. The craftsman-mind, together with the word, encompassing the circles and whirling them about with a rush, turned his craftworks about, letting them turn from an endless beginning to a limitless end, for it starts where it stops. Revolving as mind wished them to, the circles brought forth from the weighty elements living things without reason (for they no longer kept the word with them); and the air brought forth winged things; the water things that swim. Earth and water had been separated from one another as mind wished, and earth brought forth from herself the living things that she held within, four-footed beasts (and) crawling things, wild animals and tame. The Supreme Nous then created Man, androgenous, in his own image and handed over his creation. Man carefully observed the creation of his brother, the lesser Nous, and received his and his Father's authority over it all. Man then rose up above the spheres' paths to better view the creation, and then showed the form of the All to Nature. Nature fell in love with it, and Man, seeing a similar form to his own reflecting in the water fell in love with Nature and wished to dwell in it. Immediately Man became one with Nature and became a slave to its limitations such as gender and sleep. Man thus became speechless (for it lost the Word) and became double, being mortal in body but immortal in spirit, having authority of all but subject to destiny. Hermeticism, being opposed by the Church, became a part of the occult underworld, intermingling with other occult movements and practices. The infusion of Hermeticism into occultism has given it great influence in Western magical traditions. Hermeticism's spiritual practices were found very useful in magical work, especially in Theurgic (divine) practices as opposed to Goëtic (profane) practices, due to the religious context from which Hermeticism sprang forth. Using the teachings and imagery of the Jewish Kabbalah and Christian mysticism, Hermetic Theurgy was easily syncretized into the magico-spiritual world view of Europeans in the Middle Ages and Renaissance. In addition to the "mimetic drift" of these teachings into general occult theory, a few primarily Hermetic occult orders were founded in the late Middle Ages and early Renaissance. Rosicrucianism was a Hermetic/Christian movement dating back to the 15th century. It is believed to have ceased to exist sometime during the 19th century, though some claim it merely fell into complete secrecy. It consisted of a secretive inner body, and a more public outer body under the direction of the inner body. The Rosicrucian Order consisted of a graded system (similar to The Order of Freemasons), in which members moved up in rank and gained access to more knowledge, for which there was no fee. Once a member was deemed able to understand the knowledge, they moved on to the next grade. Their movement was symbolized by the rose (the soul) and the cross (the body of four elements). Thus, the Christian symbolism of the cross was reinterpreted as representing the the human soul crucified on the "cross" (four elements) of the material plane. There were three steps to their spiritual path: philosophy, qabbalah, and divine magic. In turn, there were three goals to the order: 1) the abolition of monarchy and the institution of rule by a philosophical elect, 2) reformation of science, philosophy, and ethics, and 3) discovery of the Panacea. The only source dating the existence of the Rosicrucians as far back as the seventeenth century are three German pamphlets: the Fama, the Confessio Fraternitatis, and Chymical Wedding of Christian Rosenkreutz. Some scholars believe these to be hoaxes, and that better attested (and significanly later) Rosicrucian organizations represent the actual genesis of a real Rosicrucian fraternity. Unlike the Societas Rosicruciana in Anglia, the Hermetic Order of the Golden Dawn was open to both sexes, and treated both as equal. The order was a specifically Hermetic society, teaching the arts of alchemy, qabbalah, and the magic of Hermes, along with the principles of occult science. Israel Regardie claims that there are many orders, who know what they do of magic from what has been leaked out of the Golden Dawn, by what he deems "renegade members." The order maintained the tightest of secrecy by severe penalties for loose lips. Overall, the general public was left oblivious to the actions and even existence of the Golden Dawn, making the policies a success. This secrecy was broken first by Aleister Crowley, in 1905 C.E., and later by Israel Regardie himself in 1940 C.E., giving a detailed account of the order's teachings to the general public. ↑ E.A. Wallis Budge. The Gods of the Egyptians. Vol. 1, (Kessinger reprint. 2003), 415. ↑ Plutarch's mention of Hermes Trismegistus dates back to the first century C.E., and Tertullian, Iamblichus, and Porphyry are all familiar with Hermetic writings (Stephan A. Hoeller, "On the Trail of the Winged God: Hermes and Hermeticism Throughout the Ages." Gnosis: A Journal of Western Inner Traditions (40) (Summer 1996). As such, Walter Scott dates the extant Hermetic texts to shortly after 200 C.E., while Sir W. Flinders Petrie places them between 200 and 500 B.C.E. Abel and Hare, 7. ↑ Garth Fowden. The Egyptian Hermes: A Historical Approach to the Late Pagan Mind. (Cambridge; New York: Cambridge University Press, 1986), 65-68. ↑ Gilles Quispel, "Hermes Trismegistus and the Origins of Gnosticism," Vigiliae Christianae 46:1 (March 1992): 1-19. 16. ↑ Plato, Timaeus, translated by Benjamin Jowett and accessed online at the Internet Classics Archive: "In the Egyptian Delta, at the head of which the river Nile divides, there is a certain district which is called the district of Sais, and the great city of the district is also called Sais, and is the city from which King Amasis came. The citizens have a deity for their foundress; she is called in the Egyptian tongue Neith, and is asserted by them to be the same whom the Hellenes call Athene; they are great lovers of the Athenians, and say that they are in some way related to them. To this city came Solon, and was received there with great honour; he asked the priests who were most skilful in such matters, about antiquity, and made the discovery that neither he nor any other Hellene knew anything worth mentioning about the times of old. On one occasion, wishing to draw them on to speak of antiquity, he began to tell about the most ancient things in our part of the world-about Phoroneus, who is called "the first man," and about Niobe; and after the Deluge, of the survival of Deucalion and Pyrrha; and he traced the genealogy of their descendants, and reckoning up the dates, tried to compute how many years ago the events of which he was speaking happened. Thereupon one of the priests, who was of a very great age, said: O Solon, Solon, you Hellenes are never anything but children, and there is not an old man among you. Solon in return asked him what he meant. I mean to say, he replied, that in mind you are all young; there is no old opinion handed down among you by ancient tradition, nor any science which is hoary with age. ↑ Sigfried Morenz. Egyptian Religion, Translated by Ann E Keep. (Ithaca, NY: Cornell University Press, 1973), 222. ↑ Brian P. Copenhaver (ed. & translator) Hermetica: The Greek Corpus Hermeticum and the Latin Asclepius in a New English Translation, with Notes and Introduction. (Cambridge Univ. Press,  1995) for a translation of the Hermetica, including the Asclepius. ↑ "Hermetica" at The Ritman Library. ↑ Henri D. Saffrey, "Florence, 1492: The Reappearance of Plotinus," Renaissance Quarterly 49:3 (Autumn 1996), 488-508, 492-493. ↑ Chiara Crisciani, "Hermeticism and Alchemy: The Case of Ludovico Lazzarelli," Early Science and Medicine 5:2 "Alchemy and Hermeticism" (2000), 145-159. 148. ↑ B.J.T. Dobbs, "Newton's Commentary on the Emerald Tablet of Hermes Trismegistus: Its Scientific and Theological Significance," in Ingrid Merkel and Allen G. Debus (eds) (1988). Hermeticism and the Renaissance: Intellectual History and the Occult in Early Modern Europe. (Washington, DC: Folger Shakespeare Library; London: Associated University Presses, 1988), 184-186. ↑ Salaman et al. Way of Hermes, 9-10. ↑ Faivre, 19-20. See also, Plessner: "He (i.e., Asclepius) was a pupil of Hermes the Egyptian- Abū Ma'shar says: There were three persons called Hermes- Hermes the First, lie upon whom the threefold Grace was conferred, lived before the Flood. The meaning of Hermes is appellative, as is the case of Caesar and Khusraw. The Persians, in their historical books, call him Hōshang (l), that is, the Righteous, and it is he whose prophecy the Harranians mention. The Persians say that his grandfather was Kayōmarth, i.e., Adam. The Hebrews say that he is Akhnūkh (Enoch), i.e., Idris in Arabic" (51). ↑ See Plessner (1954). See also: F. E. Peters, Allah's Commonwealth: A History of Islam in the Near East, 600-1100 C.E., (Simon and Shuster, 1973), ISBN 0671215647. ↑ See Copenhaver (1992); Salaman, van Oyen, Wharton, and Mahé (2000). ↑ Christopher R. Abel and William O. Hare. Hermes Trismegistus: An Investigation of the Origin of the Hermetic Writings. reprint (Sequim, WA: JD Holmes Publishing Group, 1997), 12. ↑ Manly P. Hall. The Hermetic Marriage. reprint ed. (Kessinger Publishing  2004), 227. ↑ Mircea Eliade. The Forge and the Crucible, Translated from the French by Stephen Corrin. (London: Rider, 1962), 149 and 155-157. ↑ Geber, Summa Perfectionis. For a new study and translation, see: William R. Newman's The Summa Perfectionis of Pseudo-Gerber: A Critical Edition, Translation and Study, (Leiden: Brill, 1991). ↑ E.J. Langford Garstin. Theurgy or The Hermetic Practice: A Treatise on Spiritual Alchemy. (Berwick: Ibis Press, 2004), v, 6. ↑ "The Emerald Tablet," translation by Georgio Beato in the Aurelium Occultae Philosophorum. Accessed online at sacred-texts.com. ↑ Three Initiates. The Kybalion: A Study of The Hermetic Philosophy of Ancient Egypt and Greece. (Chicago: The Yogi Publication Society/Masonic Temple, reprint Wilder Assoc. 2007), 96. ↑ "The Emerald Tablet," translation by Georgio Beato in the Aurelium Occultae Philosophorum. Accessed online at sacred-texts.com; Scully, 321. ↑ Salaman et al. Way of Hermes, 33. ↑ Hall, The Hermetic Marriage, 234. ↑ Corpus Hermeticum IX:3. Copenhaver, 27. ↑ Salaman et al. Way of Hermes, 42. ↑ Salaman et al. Way of Hermes, 28. ↑ Salaman et al. Way of Hermes, 47. ↑ Salaman et al.Way of Hermes, 32-33. ↑ Salaman et al. Way of Hermes, 18-20. ↑ Israel Regardie. The Golden Dawn: The Original Account of the Teachings, Rites & Ceremonies of the Hermetic Order. (Llewellyn's Golden Dawn Series). reprint ed. (St. Paul: Llewellyn Publications,  2002), 15-7. Churton, Tobias (2002). The Golden Builders: Alchemists, Rosicrucians, and the First Freemasons. New York: Barnes and Noble. ISBN 0760776105. Eliade, Mircea. The Forge and the Crucible, Translated from the French by Stephen Corrin. London: Rider, 1962. Fowden, Garth (1986). The Egyptian Hermes: A Historical Approach to the Late Pagan Mind. Cambridge; New York: Cambridge University Press. ISBN 0521325838. Hanegraaff, Wouter J. and Bouthoorn, Ruud M. (editors and translators) (2005). Lodovico Lazzarelli (1447-1500): The Hermetic Writings and Related Documents. Tempe, AZ: Arizona Center for Medieval and Renaissance Studies. ISBN 0866983244. Hermetica: The Greek Corpus Hermeticum and the Latin Asclepius in a New English translation (1992). Translated, with notes and introduction by Brian P. Copenhaver. Cambridge; New York: Cambridge University Press. ISBN 0521361443. Jacq, Christian (1985). Egyptian Magic, Translated by Janet M. Davis. Wiltshire: Aris & Phillips; Chicago, IL: Bolchazy-Carducci. ISBN 0865161186. Newman, William. The Summa Perfectionis of Pseudo-Gerber: A Critical Edition, Translation and Study. Leiden: Brill, 1991. Plessner, M. "Hermes Trismegistus and Arab Science." Studia Islamica 2 (1954): 45-59. Three Initiates. The Kybalion: A Study of The Hermetic Philosophy of Ancient Egypt and Greece. Chicago: The Yogi Publication Society/Masonic Temple, reprint Wilder Assoc. 2007. ISBN 1604590866. Online Version of The Virgin of the World of Hermes Trismegistus, version translated by Anna Kingsford and Edward Maitland in 1885 C.E.